I just posted a bunch of pictures from my trip to OOPSLA 2009, in Orlando. Really all of these pictures are from Monday, the day Josh & I went to the Magic Kingdom in Disney World. I am a huge sucker for the Disney parks, and I am willing to fork over huge amounts of $$$ in order to experience the child-like exuberance that they instill. Anyway, I had a great time. 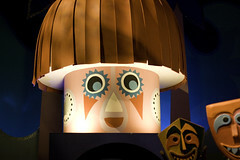 Most of the good pictures are from the ride "It's a Small World."